This is what I have been eating for days courtesy of my little garden. I have to harvest every day or else the plants will stop bearing (according to the husband anyway). The days I did not harvest I got reprimanded for it so I do what I am told to do. "This" is actually string beans or long beans or pole beans, however you want to call it. It is batong in my native Leyte but sitaw in Tagalog. 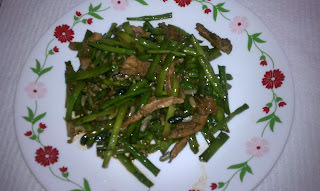 I love to cook this stir-fried with a bit of meat for flavor. I have been enjoying stir-fried beans for over a month before my mother told me it is not good for people with arthritis then I started feeling my joints hurt. I blame her for giving me that information, lol. Sometimes I cook beans with okra and other greens for soup which is good since it is healthy. My plants are starting to get old and in a few weeks I will be lucky if I get much out of them but then I probably will be sick of eating beans by then so it is not that bad. The husband asked if I wanted to can the beans but I have not decided yet. I just don't think it will taste the same as freshly picked from the garden. ayaw pataka pangangkon diha lol. Lamia baya makalaway kaau. Fresh na organic pa.
agoy, pagkalami ani tawon..hhehehe! dala ko ug bahaw mami...hehehe!